Discount applied when purchasing 6 or more bottles of the same cuvée. Delivery is free for orders over £100. For orders under £100, a £9.99 charge will be added to your order. For full delivery details see our Delivery page. The finest and Luxurious Gift Set! 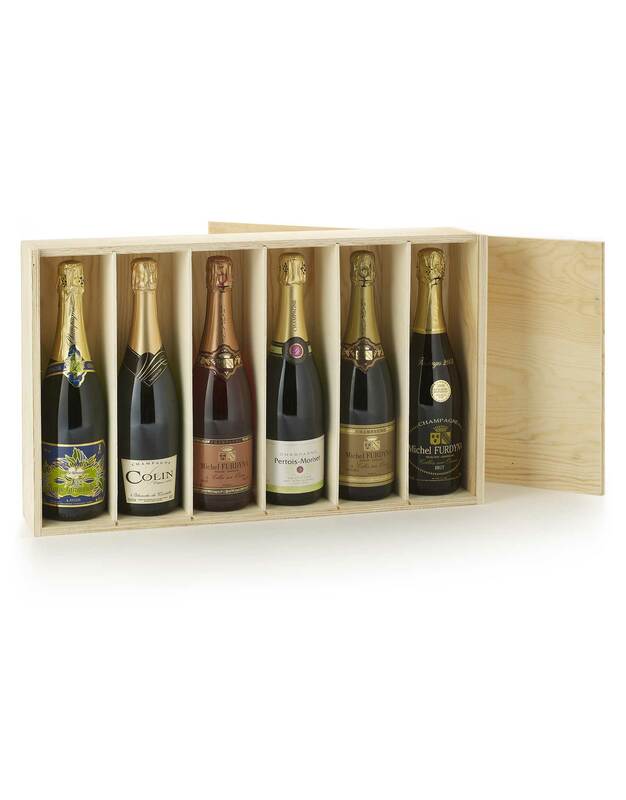 Beautiful present this amazing wooden box set with an exceptionnal French Bubbles Selection. Produced from classified 1er Cru, Grand Cru vineyards. This is a great insight of the main style of our Growers: Enjoy this 6 different cuvées! Lacroix Cuvée Tradition Brut – The nose of this friendly wine reveals subtle apricot and strawberries flavours. It is impossible not to enjoy the lively berry fruitiness coming from Meunier that dominates this blend. Forward fruity and rounded with a great persistence that leaves you and your guests wanting a further glass. Waris-Larmandier Racine de trois Brut – The non-vintage Cuvée Racine de trois is very fresh and lively. It dances on your tongue with a core of zesty citrus and apple flavours and undertones of candied fruit. Enjoy now or let it sit happily in your cellar developing further for a couple more years. Legallais Cuvée des Cèdres Brut Nature – This cuvée has an expressive and complex nose, lovely dry, nicely evolved, on strewed red fruits and honey. The palate is on the same way, smooth, round, complemented by notes of honey, toast and citrus freshness, lightly aniseed. Furdyna La Réserve Blanc de Noirs Brut – It has the typical Pinot characteristics and offers excellent value.The slightly warmer climate of Michel’s vineyards in the south of the region is reflected in the approachability and sheer drinkability of this harmonious wine. Forward in fruit and generously proportioned, this will not disappoint. Colin Blanche de Castille Blanc de Blancs 1er Cru Brut – A step up in depth, persistence and intensity from the Alliance and aged for at least 2 years and usually longer. A fresh yet creamy texture, long toasty finish, and that come-hither femininity typical of fine Blanc de Blancs is very evident. Pertois-Moriset Rosé Grand Cru – This cuvée has an elegant and intense colour and floral aroma with plenty of summer fruit flavours on the nose. It is very subtle on the palate, floral with a very well balanced acidity and superb minerality.